A nonprofit corporation called BoldlyGo Institute (BGI) is developing a Mars Sample Return mission called the Sample Collection to Investigate Mars (SCIM) which will return the first samples of Martian materials back to Earth. The project is at the preliminary design stage and the goal is ambitious. With a launch date of July 26, 2020, SCIM will journey through space for two years. 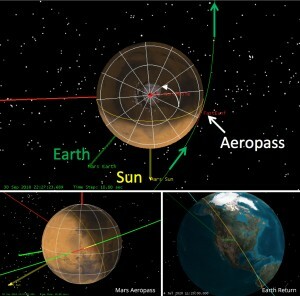 When it reaches Mars, it will swoop down and collect the dust particles from the Martian atmosphere below 40 km. The SCIM has an aerodynamic aeroshell allowing it to rapidly pass through the atmosphere without being captured by Mars’s gravity. The sample capture mechanism for the Mars Sample Return Mission is similar to the successful collection system for the Stardust mission which used aerogel to capture dust particles. After collecting thousands of particles, the spacecraft will leave Mars on August 3, 2022 and return directly to Earth by February 1, 2023 where the sterilized samples will descend by parachutes to the ground. Sample return offers advantages over the current and past robotic missions to Mars where samples have been only analyzed on Mars. Earth-based lab instruments are much more sophisticated than what can be packed into a Mars rover or lander allowing much greater detailed analysis. Furthermore, there is no time limit for analysis; as more advanced instruments are developed, they can be applied on curated samples. Lastly and perhaps speaking most intriguingly of BoldlyGo Institute’s philosophy, participation can involve hundreds of scientists and students–many of whom may not be traditionally involved in the Mars science community. Currently, the SCIM project for Mars Sample Return involves researchers from several universities, the Jet Propulsion Laboratory (JPL), the Space Science Institute, Lockheed Martin, and the BoldlyGo Institute which leads the integration and design. Founded in New York on October 2013, BoldyGo Institute is led by Dr. Jon Morse who previously served as the Director of Astrophysics in the Science Mission Directorate at NASA Headquarters. BGI funds itself through NewSpace approaches and actively seeks funding from the public and private channels. Morse says that no other non-profit currently exists with the focus solely on scientific discovery. The organization hopes to generate enough private funding to conduct discovery or probe class mission, which is beyond the price-range of most research organizations and universities. For the SCIM mission, the required funding will be on the order of “several hundred million dollars”, an ambitious goal to reach in the next six years. A Mars Sample Return mission has not been done yet. However, for more information on astromineralogy and the previous Stardust mission’s sample analysis, consider reading Astromineralogy (Lecture Notes in Physics) by Thomas Henning.